The first problem with hiking in Alaska is knowing where to start. The 57 million acres of Alaskan wilderness is more that the rest of the US put together, but guidebooks, trails and even roads are sparse in much of the state. There are trails in Alaska, however, especially in the Chugach mountains near Anchorage, on the Kenai peninsula, and around Juneau, and the hiking and scenery even in these "tame" wildernesses matches or surpasses the best hikes I've done in the lower 48 states. This page summarizes some of the best day hikes that I found within a day's drive of Anchorage. Trailhead: Harding Icefield / Exit Glacier trailhead, in Kenai Fjords National Park. 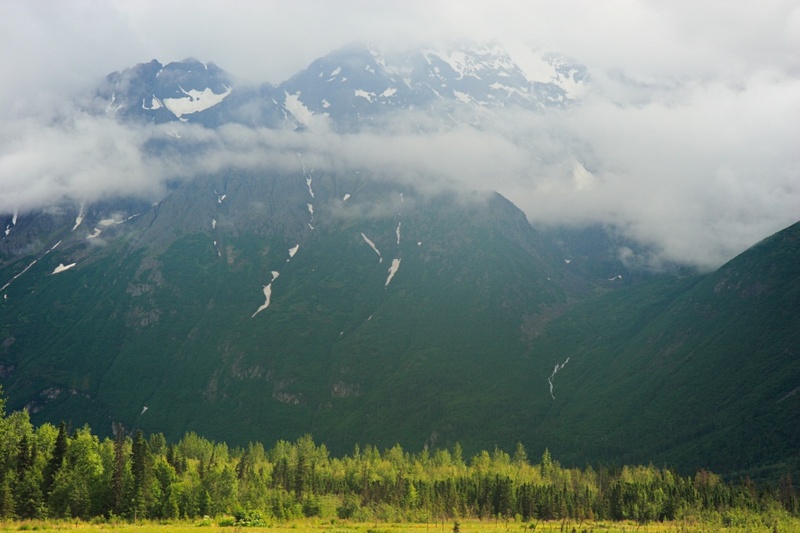 The park is a short distance from the town of Seward, about 120 miles south of Anchorage. Distance: 8 miles round trip, with about 3,000 feet of elevation to the overlook of the Icefield. The hike to the Harding Icefield is the only real trail in Kenai Fjords National Park, but what a trail it is! This is one of my favorite hikes in Alaska, and even if you're staying in Anchorage it's well worth driving the 120 miles or so to the park just for this hike. The drive is scenic in its own right. The upper reaches of the trail are covered in snow for much of the summer (certainly in late July when I did the hike), but the route is well marked and popular enough that this doesn't pose any particular problems - the trail is slippery in places but can be tackled without special equipment. The trail starts at the Visitor Center near the terminus of the Exit Glacier - like so many glaciers in rapid retreat - and climbs along the side of the valley above the glacier to reach its source at the Harding Icefield. The trail is well constructed but indisputably steep, especially for the first mile and a half or so that it takes to climb above the tree line. Good views start at the 1.3 mile mark at Marmot Meadows where, on the day we did the hike, one of the eponymous critters was contentedly basking on a rock just by the trail. From there, the trail ascends to the Top of the Cliffs overlook at 2.3 miles - from where the panoramic vista of the Exit Glacier above was taken - before continuing somewhat less steeply to an emergency shelter and the icefield overlook that marks the end of the hike. An icefield makes a difficult photographic subject - a sheet of white nothingness - but when you're there in person the views of the glacier, together with the panorama of peaks in the coastal mountains and the icefield itself stretching off into the distance, are extraordinary. Bears (both black bears and brown bears - the name given to grizzlies in Alaska) are commonly sighted in the Exit Glacier area, and we saw a number of black bears foraging in the area and crossing the snow slopes above the trail. The bears were surprisingly nimble on the snow. Trailhead: Crow Pass trailhead, about 45 miles from Anchorage. From Exit 90 on the Seward highway, head north 2 miles, then turn left onto Crow Creek road (unpaved, but in good condition). Fork right after the bridge about 5 miles in to reach the parking area. 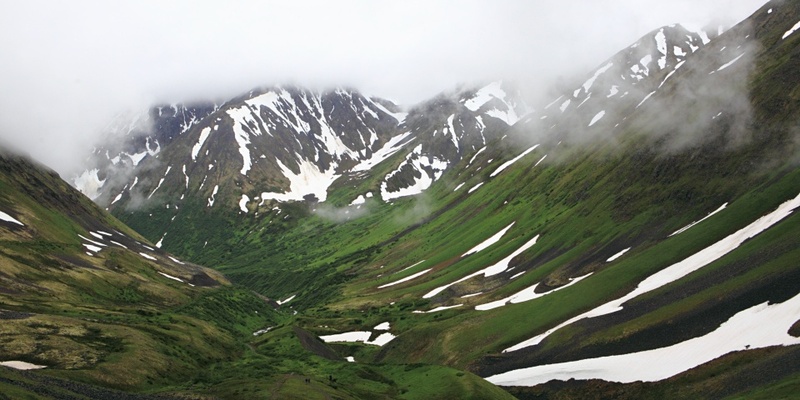 The Crow Pass trail combines a historic flavor - this was the route of the Iditarod trail between Seward, Knik, and Alaskan gold mining areas - with spectacular and varied scenery. The highlight is the Raven Glacier, which, although not enormous by Alaskan standards, has a great backcountry setting. The trail is well-maintained, and in season (mid-June to September, depending on the extent of winter snows) this is a popular, moderate day hike that I'd highly recommend. The Crow Pass trailhead is already at moderate elevation, and it takes only a short time to clear the trees and emerge onto the slopes of the Crow Creek valley. From there, it's a basically straight route up the valley to reach the pass at its head. There are a couple of different trails, a lower route that passes some old mining detritus and a small waterfall, and a slightly easier route that cuts higher along the east side of the valley. The junctions are easy to miss, but as long as the creek above the waterfall is easy to cross (as it was for us, doing the trail in mid-July) it doesn't really matter which route you take. Reaching Crystal Lake at the head of the valley, the climbing is over, and the trail continues gently over the pass to reach the Raven Glacier and a view down along Raven Creek toward the Eagle River valley. Backpacking option: The trail continues past the Raven Glacier, descending the Raven Creek and Eagle River drainages to emerge at the Eagle River Nature Center north of Anchorage. The shuttle backpack is about 26 miles, requires one unbridged stream crossing, and involves less climbing if you start from the Crow Pass trailhead end. Trailhead: The trailhead is about 4 miles along the Knik River Road, off the old Glenn Highway maybe 30 minutes drive north of Anchorage. There's a small fee for parking. The paved Knik River Road continues further up the valley, but there's no view of the glacier to be had from the road. Distance: 9 miles round trip to the ridge, though it's possible to continue further to the South Summit of Pioneer Peak. The trail is dotted with a number of picnic table but make no mistake - it's steep! It's about 5000 feet of climbing to reach the ridge and the best views, from where the panorama below was taken. On a wet and cloudy day this hike is good only for testing your fortitude and that of your equipment. Although the trail is well-maintained, it is steep, slippery, and punctuated by stretches of boot-sucking quagmire. Most of this is true whatever the weather, but on a clear day the outstanding panorama of peaks visible from the Pioneer Ridge more than compensates for the effort required to make the climb. Once you clear the trees and bushes that clog the lower slopes of the mountain the Knik glacier, 25 miles long and several mides wide at its terminus, dominates the view toward the high peaks at the head of the valley. It's an exceptional sight, made all more remarkable for its proximity to the city of Anchorage. Note: from the map it's clear that an even better view of the Knik glacier would be possible if you could climb either Knik mountain or Hale-Bopp peak starting further along the valley. The road goes far enough and the climbs are said to be straightforward once you get above treeline. Access though is tricky - the land in the valley is privately owned, some of it (apparently) by survivalist types not keen on visitors. Trailhead: The Twin Peaks trail leaves from the main parking area at Eklutna Lake. There's a fee for parking, and a bike rental shop at the trailhead. Distance: 7-8 miles roundtrip to East Twin Pass, with about 3500 feet of elevation gain. Heading north from Anchorage, three successive valleys offer hiking possibilities: Eagle River, Eklutna Lake, and the Knik River. 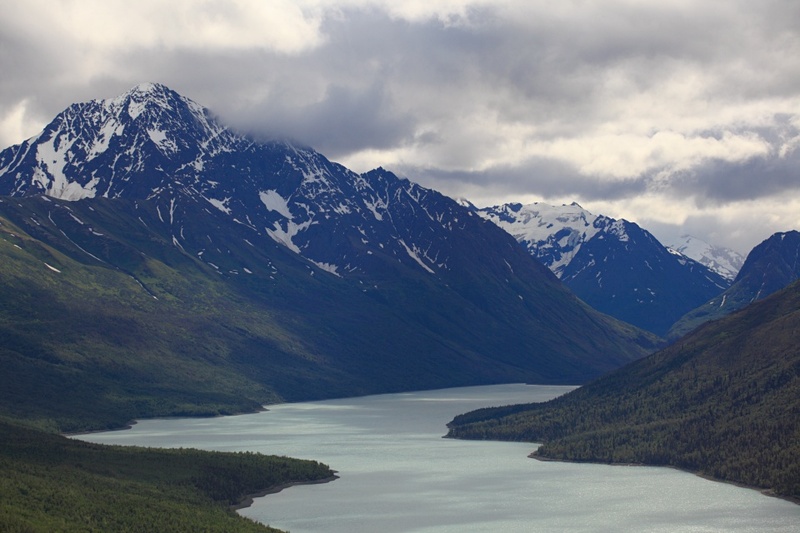 Eklutna Lake makes for an attractive destination, and if you're looking for an easy day hike or bike ride a trail runs along the shore of the lake for some 15 miles toward the Eklutna glacier at its head. More strenuous hikes ascend the valley slopes for expansive views of the lake and surrounding peaks. We did the East Twin Pass trail, which starts as an excellent (and only moderately steep) trail that ascends to a great view out over the lake, before continuing to reach the tree line in a high side valley to the north. We saw a moose on the trail here. The maintained trail ends at a bench about 2.5 miles and 1600 feet from the trailhead. From the bench, a much rougher path heads initially downhill to cross the creek, before ascending to East Twin Pass. This last part of the route is clear and east to follow, but brutally steep. The view into the Matanuska Valley from the the top isn't quite enough reward for the effort, in my opinion, but it's still excellent. We had lunch here and returned, but it's also possible to ascend the ridge further in either direction, though bagging either of the Twin Peaks is a more technical endeavor. If you have (or rent) a bike, an alternative is the Bold Peak hike, which leaves from a trailhead about 5 miles down the lakeshore trail. The trail is of similar difficulty to the East Twin Pass trail (about 7 miles roundtrip from the lake, with 3500 feet of climbing, and although I haven't done it I suspect it offers even better views. Trailhead: The trail to Portage pass and on to the lake is close to the town of Whittier, 75 miles from Anchorage. Coming from Anchorage via Portage the trailhead comes shortly after you exit the Anton Anderson Memorial tunnel (one way and shared by cars and trains, so entertaining in its own right) - take the first right across the railroad track onto a dirt road and then a second right past a cinder block building to reach the signed trailhead. Distance: About 4 miles roundtrip to the lake. The trail to the pass is moderately steep but well maintained, whereas the trail down to the lake is steeper and (when we did this, way back in 2008) showed no sign of having seen a trail crew in many a year. 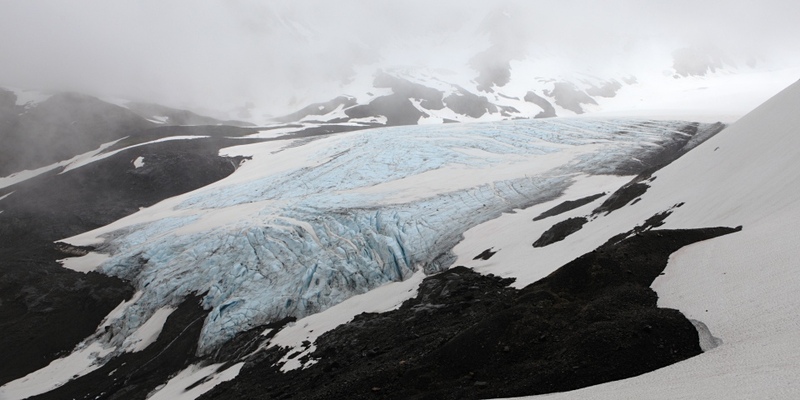 This is a short hike to a magnificent close-up view of the Portage glacier, made somewhat adventurous by the deteriorating condition (back in summer 2008) of what passes for the trail. Starting from the trailhead a good quality trail climbs briskly to Portage pass, which offers a good view of the namesake glacier and lake. The pass makes a good destination for a short and easy day hike. If you have even the slightest spirit of adventure, however, you'll want to reach the shore of the lake, which is a different matter altogether. 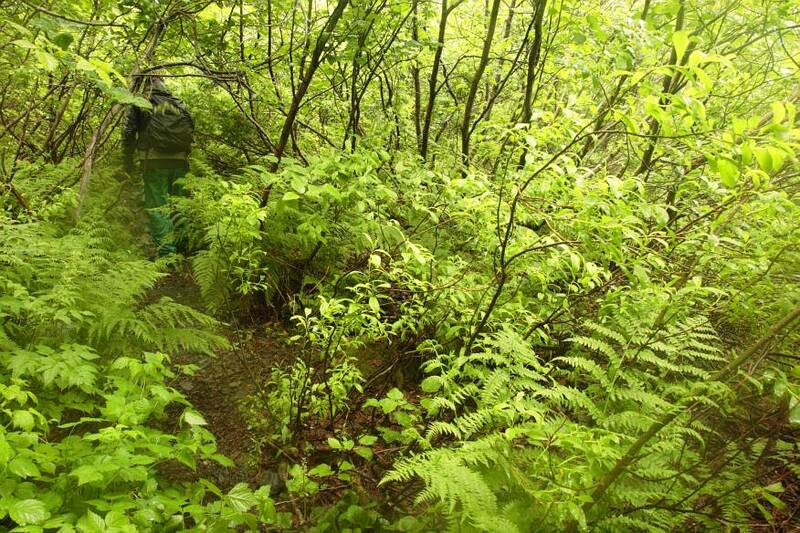 There is a trail, but it's heavily overgrown and in danger of succumbing to erosion into a deep gully in numerous places. Good luck if you run into a bruin here! On a wet day - and Whittier is a very wet place - expect to get absolutely sodden. For all that I enjoyed this hike a lot, and having finally reached the lake we had the view all to ourselves... until that is a tour boat from down the lake showed up! Trailhead: The trail starts at the Eagle Valley Nature Center, a short distance north of Anchorage. There's a fee for parking. The Eagle River Valley is quite attractive and there are a variety of short loop hikes you can do close to the Nature Center. We saw a woodpecker here, and later in the season bears congregate to fish along the river, so there's a chance of seeing wildlife. You can hike as far as you want along the valley but it's miles of rather tedious trudging through trees before you get to the best views. If you want to see the glaciers at the head of the valley, you're better off starting at the other end of the old Iditarod trail and ascending to Crow Pass. Trailhead: the hike starts from the Eielson visitor center in the interior of the park, at mile 63 along the park road. The road is closed to private vehicles, so you'll need to book a shuttle bus going at least far as Eielson to do this hike. Taking an early bus maximizes the chances of seeing wildlife along the way. Distance: it's just one mile on a fairly steep trail to reach the ridge above the visitor center. It's then possible to walk for miles on informal trails (or simply across the open alpine area) in either direction along the ridge. Including hikes in Denali on this page is something of a cheat - Denali National Park is within an easy day's drive of Anchorage but you can't do a day hike there while sleeping in the city. Nonetheless Denali is, with good reason, high on most visitors' Alaska wish-lists, and I'd highly recommend you try and visit if at all possible. The interior of Denali National Park is often described as being trail-less but it's not really true - there's a formal trail up to the ridge above the Eielson visitor center and other places where informal but clear routes exist. Eielson is about as close to Mount McKinley as you can get along the park road, and from the visitor center or from the ridge the view of the mountain is incredible. When I did this hike low clouds obscured the view from the visitor center, making the appearance of the mountain as we reached the ridge all the more dramatic. The formal trail ends at the ridgeline, but it's easy to hike in either direction along the ridge and it would be quite possible to spend half a day (about all the time one has given the bus schedules) doing so. One should be aware that the mountain is frequently lost in clouds (we saw McKinley for all of about 3 hours in 4 days spent in the vicinity), so I'd advise spending some days in Denali to at least give you a fair chance of getting a view. The bus system in Denali is simply excellent (and given the state of the road, you might not want to drive it yourself even if it were allowed!) and you can get on and off the shuttle buses almost anywhere to go for a hike. Much of the terrain - for example along the Toklat valley and near Thorofare pass - is invitingly open, and the only significant impediment to hiking is the difficulty of crossing streams. 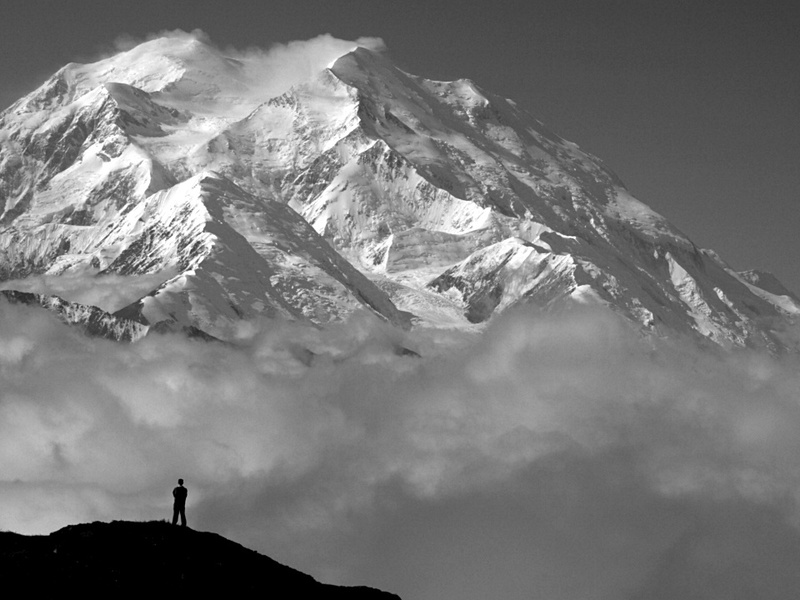 If I return to Denali, cross country hiking will be at the top of my priority list. It goes without saying that the main season for hiking in Alaska is summer, with late summer (toward the end of August) probably being the optimum period as far as weather, mosquitos and color goes. Whenever you go I'd recommend going prepared for rain. For hikes in Chugach State Park you can stay in Anchorage, which is close enough to Whittier and Seward that driving there for day hikes is straightforward. It's worth staying downtown in Anchorage, where there are a number of decent pubs and restaurants (I'd second the ubiquitous recommendations of Humpy's Great Alaskan Alehouse). Denali National Park is about 230 miles north of Anchorage. Denali is not close to any large town - you can stay either at the park entrance (where there are some large hotels and a few reasonable restaurants) or in very small places such as Healy a few miles down the road. 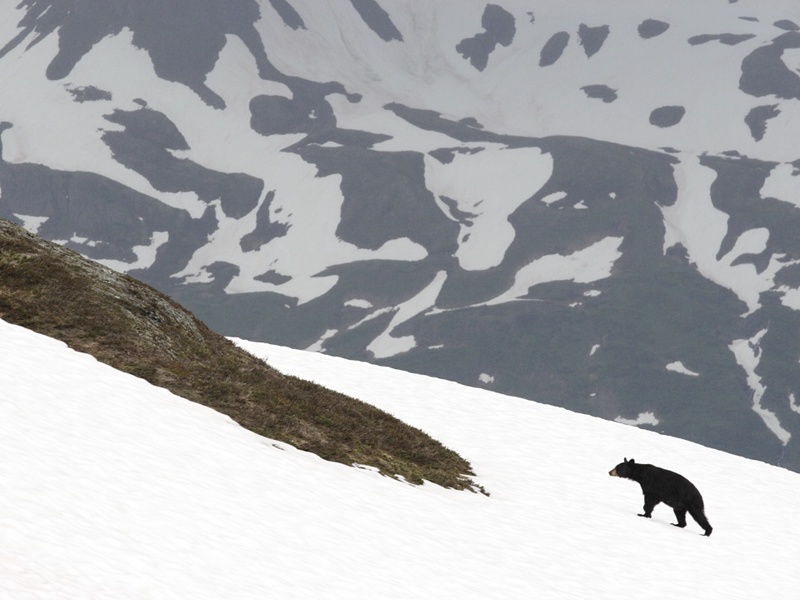 Seeing wildlife is a prime attraction of visiting Alaska, but can be a concern when out hiking. Although I've not seen a brown bear from the trail, there are few if any Alaskan hikes where a bear encounter is not possible. We've followed the standard advice which is to make plenty of noise, especially when visibility is limited, and carried bear spray. You'll also see locals carrying guns, which is pretty normal in Alaska but initially surprising if you're from Europe! If, on the other hand, you want to see bears I'd recommend either the bus tours in Denali, or visiting one of the managed bear viewing sites. The video below shows a visit I made to Pack Creek, flying by float plane from Juneau. It was great fun!